Details Rublev Colours Nicosia Green Earth is a transparent deep green with yellow undertones, medium grained and low tinting strength. Our Nicosia green earth is from glauconite deposits in Cyprus. The color of glauconite, a mineral of hydrated iron potassium silicate, varies considerably from pale green to dark green and from bluish-green to olive-green, depending upon its constituent elements. Natural green earths, such as Nicosia green, are transparent and are absolutely permanent in oil. Most oil colors labeled "green earth" from artists' paint manufacturers do not actually contain the natural mineral, but rather is a mixture of synthetic chromium oxide green and sometimes barium sulfate with either a natural yellow ochre or yellow iron oxide. 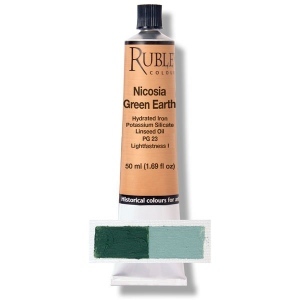 Rublev Oil Colours Nicosia Green earth contains only the actual mineral and linseed oil. Green earth was used in verdaccio--a style of underpainting that uses green-grey colors to establish values for later layers of paint. Verdaccio is renowned for being particularly effective when painting flesh tones. It was popular amongst Italian Renaissance artists, such as Leonardo da Vinci who used verdaccio underpainting in his masterpiece, the Mona Lisa.